Experts—who say coding audits should be part of every hospital’s compliance plan—suggest six strategies for setting up the best possible program. If you are an HIM professional working in a hospital, chances are you have participated in a coding audit, complete coding audits on a regular basis, or have at least had discussions about implementing an internal strategy for such initiatives. It’s a sign of the times. As hospitals continue to feel pressure from federal watchdogs for improved compliance while seeking to capitalize on all revenues in a tight economy, effective coding practices become key to the overall strategy. “I think because of this, [hospitals] have really gotten more involved over the last six years,” says Julie Daube, BS, RHIT, CCS, CCS-P, manager of coding quality review and education with Chicago-based Care Communications. While most healthcare organizations understand the urgency of internal and third-party audits, the effort often may take a backseat to other day-to-day issues, especially as resources continue to be tightened. Gold points out that industry goals for audits fall somewhere in the range of a 90% to 95% accuracy rate and that average standards should not be lower than 95%. With the bar set high for overall performance, industry experts lend their advice on how best to approach coding audits. Dunn points out that the first step to establishing a coding compliance program is to define the goals. “Ask ‘Why are we establishing this program?’” she suggests. Potential reasons could include the need to comply with strategies set out by the overall companywide compliance program; an effort to improve the quality of coding, reimbursement, or documentation; a strategy to improve data quality profiles for physicians and facility; or to address issues that surfaced in an external audit. Goals should be measurable and include industry benchmarking, Dunn suggests. “Once the goals are defined, the program should define its ‘current state’ and establish a baseline coding quality expectation,” she says, adding that the gap between the two will help the coding manager identify the audit topics that need to be conducted. Dunn also suggests using industry resources such as the AHIMA’s Benchmarking to Improve Coding Accuracy and Productivity book, which provides guidelines for measuring coding quality. Experts agree that coding audits are primarily a function of HIM and compliance. The buck doesn’t stop there, though, according to Gold, who emphasizes that key executives should also be part of the process. “The CEO and board should be made aware of results,” he says, not to mention the chief financial officer (CFO), who is concerned about reimbursement issues. Dunn says a typical team includes obvious participants such as the compliance officer, the CFO, case management, and HIM. She also suggests there are others who may be considered. Daube adds that it’s also a good idea to involve IT and a physician advisor because clinical documentation and reporting are key to the overall goal of improving accuracy. Beware of just implementing one strategy model, Gold cautions, pointing to organizations that either use only an internal staff model or those that look solely to external groups to tell them what is wrong. Gold recommends that alongside an internal audit strategy, healthcare organizations should look to expertise within their corporate head entities, as well as periodically including third-party external consultants. Dunn says organizations with sufficient internal team staffing—including a coding compliance coordinator—often have the inherent advantage of knowing their team members. “Often, internal staff members are more aware of the weaknesses of team members and can focus their review efforts on those weak points and provide one-on-one education and oversight of those team members until the deficiency is eliminated,” she says. While many hospitals have an established objective to routinely have an external audit, many may be finding it more difficult to allocate resources to such an endeavor, notes Dunn. He also suggests that an organization do a reasonable sampling of service lines. “If you are Indiana University [Medical Center], you probably want to look at transplants. Focus on your most frequent cases,” Gold says. Potential and known weaknesses should also drive the sampling, Dunn says. “Often, the items audited are those where variances have been identified in the past,” she notes, pointing to indicators such as conditions resulting in denials or a RAC review, high error rates, high reimbursement or cases that may impact reimbursement, and conditions that require specific documentation elements. To get the initiative started, Daube suggests that an organization may want to use a broader sampling that includes pulling both random and specific records to obtain a baseline for moving forward. “There is an industry standard that suggests 5% of discharges or 30 per coder,” she notes. Experts suggest that facilities invest in some type of audit software to properly equip their team going forward. While there is an up-front cost, most agree that the return is well worth the purchase. “I think it typically will pay for itself … just like an investment in external reviews,” Daube says. For those organizations not willing to make the investment, Dunn says a simple spreadsheet to capture results and demonstrate the auditing program’s value is important. “This tool should display the progress of the program and be able to project the fiscal benefits of the program to those who may be hesitant to fund the program and include the internal or external labor required, educational programs, resources and reference materials, and other expenses,” she says. 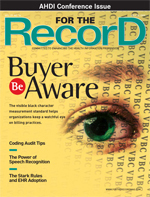 Opinions vary as to whether EMRs make the auditing process easier. Gold has found that the lack of EMR standards actually complicates the process, especially when it comes down to reviewing large amounts of text. “I have not seen an EMR program that’s worth anything in order to analyze progress notes,” he says. Dunn points out that EMRs can potentially help if they have built-in rules to provide notifications of missing elements and identify the presence or absence of some of the conditions to be audited. Don’t waste the effort and resources put into a coding audit by not making the most of the resulting data, according to the experts. Dunn agrees, adding that once the audits are conducted, the results should be compiled and trended until the coding quality goal is achieved consistently. “The results must be shared with the coding team members, used to define educational opportunities for the team members, and utilized to build the next phase of auditing efforts,” she explains. And don’t stop there, Daube says. Once the goal is achieved, organizations should be looking to broaden their auditing goals to identify new areas of improvement that may not have been in the initial target. “You don’t want to be stuck in a rut. If you see improvement, broaden the effort,” she suggests.